One of the joys of this Second Season is having gained a little wisdom through much trial and error. Being a “type A” I have always enjoyed organization and the challenge of trying to be efficient. Over the years, I have learned being effective is even more important than being efficient. Sometimes the two are not compatible. Yet, other times, the two come together in beautiful simplicity. This week I have had one of those moments. In an attempt to save time and money, I typically schedule an errand day. Most weeks this falls on Monday. It just seems to be a good day to restock and get those errands out of the way before the week’s activities encroach on my time. Armed with a list or two and various stacks of coupons off I go! But more often than not, the coupons fall out of the paperclip or get hung on the inside of my purse. The lists (one for groceries, one for WalMart/Target, and one for other errands) get bent and tattered. I’ve tried clipping the coupons to the itemized lists, but yet again, they get pulled away from the list, I drop the coupons or list trying to juggle cart, purse, pen and lists! Frustration, frustration, frustration. Being a “lover” of all things organizational I am surrounded by friends selling Thirty-One Products. (If you are not familiar with this line of products I highly encourage you to Google them and find a consultant near you!) It hit me. 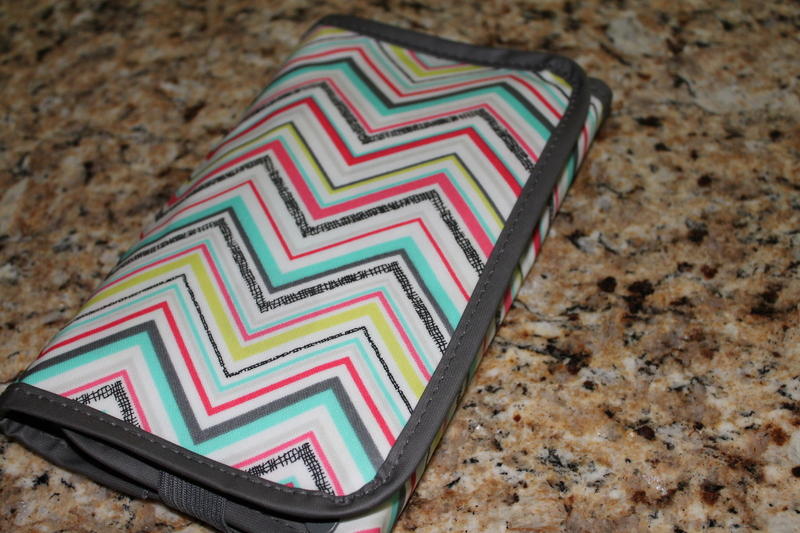 They have this great little purse size organizer perfect for my Errand Day! 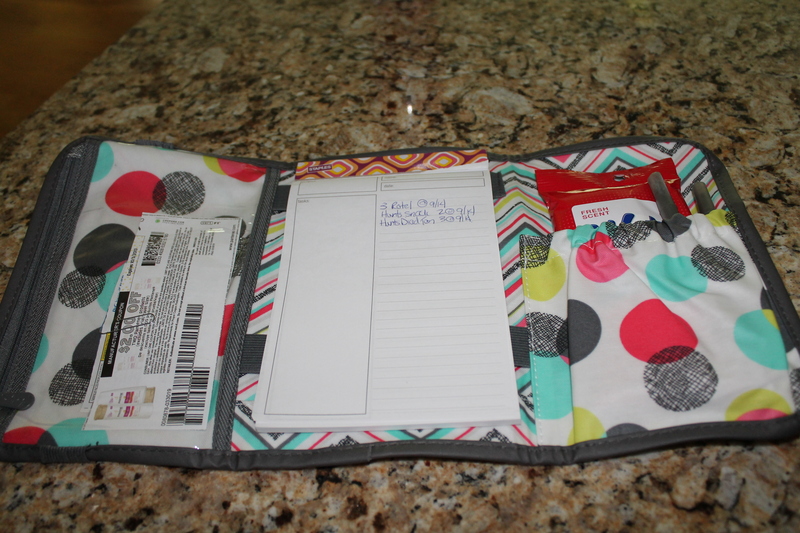 Below you will find pictures of my handy little Errand Day organizer. On the left is a clear, zippered pouch. In it I place my paper-clipped coupons, each stack corresponding to one of my lists. In the center is a lined notepad (purchased at Staples). I have a written list for each: groceries, Wal/Mart/Target, and Miscellaneous. On the right is an elasticized pouch perfect for holding a package of wipes (is it only me or do you frequently find yourself wanting to wash your hands at the grocery store? ), my pens and if needed highlighter. After getting it put together, coupons clipped and sorted, lists made, I was absolutely giddy with excitement! So, off to Goodwill, Office Depot, Target and the grocery store I went. I didn’t drop a thing. My coupons remained in tact. With pride I ripped off each list as I completed it and threw it in the trash receptacle on the way out of the store. Even more exciting, was being stopped by three other moms, each asking where I’d gotten my handy little organizer! So, Errand Day has been re-invented. A small victory in life, but one that impacted my mood for the day, allowed me to better serve my family, and meet a few young moms along the way. I also hope I was able to send a little business to my three favorite Thirty-One consultants. The real lesson though, is this: When something is not working, I need to step back, give myself some time to reflect and come up with potential solutions. of the post I realized it’s new to me. Anyways, I’m definitely glad I found it and I’ll be bookmarking and checking back frequently! Thank you. I use a theme free from wordpress. Appreciate the compliment on content. Keep trying to improve and be more consistent. Hello there, You’ve done an incredible job. I’ll definitely digg itt aand personally recommend to my friends.